What links are made to the curriculum? Are these links at purely a state level or do you aim to connect to the national curriculum, too? DP: We worked closely with our education team at Scienceworks to figure out which curriculum links we wanted to make. We really wanted this exhibition to inspire 12-15 year olds to think about Science and Technology as a career they might pursue in school and beyond. And the most likely way that age group will visit the museum is with their school. So it was really important to have strong links with the Victorian Curriculum to help drive that visitation. There were a few specific outcomes we worked into the Beyond Perception interpretation. Most of the programs focus on lines of enquiry and science as a human endeavour. We wanted the school groups to really explore the science stories from local universities and research institutions, and find all of their great work. 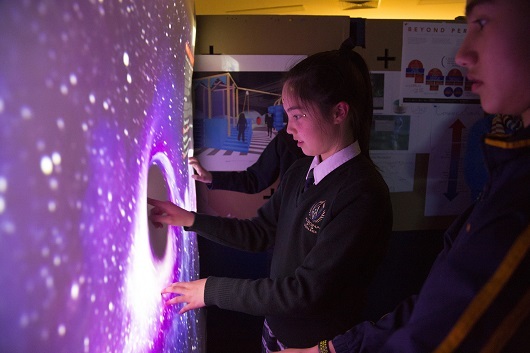 The topics covered in each area of the exhibition include: light and sound, gravitational waves, particle accelerators, microscopic worlds and aerodynamics. Curriculum links include: Physical Science (Year 7-8); Chemical Science (Year 7-10); Science Inquiry skills (Year 7-10); Earth and Space Science and Earth and Chemical Science (Year 9-10); Music and Design technologies (Year 9-10); Science as a human endeavour (Year 7-10) and VCE Physics Units 1-4. How often do you revisit the exhibition’s features to adapt aspects in order to keep up-to-date with a changing education landscape and changing job prospects for students? DP: There’s an operations team that look after the daily upkeep of the exhibition – fixing broken bits, maintaining the technology, keeping everything running smoothly. And then we have a process for revisiting the exhibition a few times through its lifetime to update any content or stories that might have changed. For example, there’s an area in the exhibition about gravitational waves. Because the first detections of gravitational waves happened in 2015, we’re fairly certain that field of science is going to grow and grow over the life of the exhibition, so we can change and update the section to reflect that. I think that’s a critical part of the story we wanted to convey, that science isn’t finished; there are still discoveries to be made and work to be done by the scientists of tomorrow. Throughout this process, Scienceworks enlisted the help of JBoard: a group of teenage consultants aged between 12 and 15 years old. Feedback was sought during monthly meetings over a nearly two-year period in order to make Beyond Perception as appealing and engaging for teenagers as possible. Here, a member of JBoard, Tanya Kovacevic, describes how this experience enhanced her understanding of the STEM industry. What was your role in the development of the Beyond Perception exhibition? What feedback did the developers seek from you? Tanya Kovacevic: As I was a part of JBoard, I participated in trialling prototypes and providing feedback. The main feedback the developers wanted from us was if we thought it would appeal to other teenagers, and how they could make it more appealing. There was no holding back if we thought something just wasn’t going to work; these things would get a ‘just don’t’ rating on our scale. It was great to see that our opinions were greatly appreciated. What did you learn about STEM from the exhibition? TK: I learnt that STEM doesn’t solely consist of working in labs. It can be doing fun things like working on exhibitions and educating others. I also learnt a lot about the invisible aspects of Science, which is what Beyond Perception is about. I hadn’t previously explored that part of Science, and it showed me how different branches of Science can interlink and still be awesome. It’s a different way of learning, which is what I think is the best thing about it. It’s very interactive, so you’re not sitting in class and copying information from a PowerPoint presentation. You get to have so much fun while learning these things, but in a way that’s entirely different to how it’s done in class. 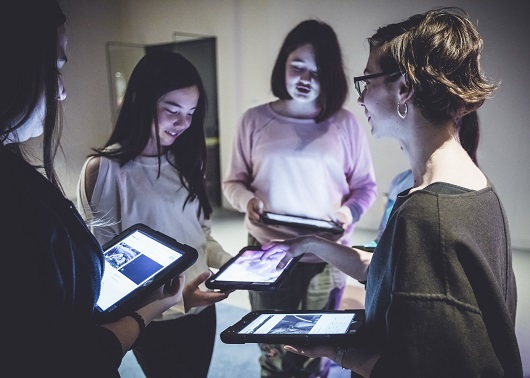 Also, being made in conjunction with teenagers lets other students my age see what careers STEM can lead to, particularly as ‘exhibition designer’ is one of the last careers we associate with Science and Mathematics. I never even dreamed of being a part of something like Beyond Perception. I was able to be a part of something that would last for years on end, which was made to teach me and my fellow teenagers, while also having so much fun. It revealed a new side of STEM, and it’s something I always tell people my age about to get them interested. Think about a Science unit you’re due to teach in the coming months. Will you be able to offer students an immersive experience which links to the curriculum outcomes? Student Tanya Kovacevic says her understanding of what a STEM career is has developed by participating in this project. In what ways could you help students understand the broad range of STEM career paths that exist?